Athletics Victoria is the governing body for athletics in Victoria, with more than 60 affiliated clubs across the state. We boast over 5,000 registered athletes, officials and coaches, and conduct competitions and events for athletes over 12 years and of all abilities. Athletics Victoria’s mission is to promote, develop and grow athletics as a vibrant, healthy, fun and accessible sport to all Victorians. 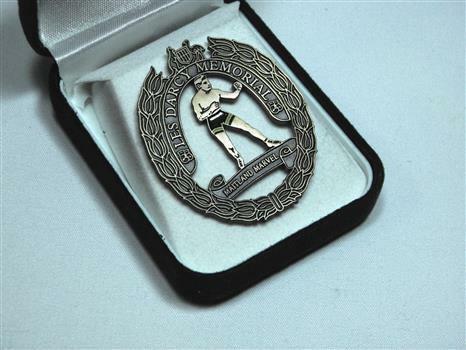 Athletics Victoria is a Member Association of Athletics Australia, and works closely with Little Athletics Victoria, the Victorian Masters Association, the Victorian Athletic League and Victorian secondary schools. Athletic Programme, Illustrated, cover, 16 pp. This booklet celebrates the 25th Zatopek Classic Athletics Meeting and was attended by Emil Zatopek at Olympic Park, Melbourne 19th December 1985. This booklet is significant because it was the Silver Jubilee of this important event and the booklet must be considered rare as it has been signed by Emil Zatopek who is now deceased. This item is of significance because it commemorates the unveiling of a life size bronze statue of Australian middleweight boxing champion Les Darcy at Maitland, NSW. This limited edition badge was given as a memento to the sponsor's of the monument and special guests who attended the unveiling. It has historic relevance because Les Darcy was born at Stradbroke near Maitland in 1895. He died in America in 1917 age 22 and is buried in the West Maitland cemetary where hundreds of tourists make visits every year. His family home in Maitland still stands and is also a tourist attraction although privately owned. The badge depicts an image of Les Darcy in his famous boxing pose.The figure of Darcy is surrounded by a floral motif depicting the Australian coat of arms at the top and the inscription Les Darcy Memorial encircling his image. A scroll at the bottom of of the medal says; Maitland Wonder. VAAA blazers were issued and worn by athletes and officials representing the state of Victoria at athletic meets at home & interstate. This VAAA pocket has been cut from a club blazer. The have the honour of being presented with a VAAA blazer is high recognition of an athlete's ability and acknowledgement of their achievements at the highest level of competition. VAAA logo depicting a flaming Olympic Torch inside a large white "V"above the letters A.A. A.